With Quinn Hughes and Tyler Madden playing for Team USA, Canucks fans have been watching their games at the World Juniors closely, hoping for a glimpse of the future. Hughes is a particularly exciting player – he was Vancouver’s first round draft pick last summer and he holds the promise of being a number one defenceman – something Vancouver has never truly had in their history in the NHL. While fans watching Friday’s semi-final, which USA won 2-1 over Russia, may have been underwhelmed after hearing so much about Hughes’ playmaking abilities, there’s good reason for his conservative play, he explained. “Right now it’s not about me trying to be a hero skating up the ice,” Hughes said after the game. Hughes hopes Canucks fans see some of the other things he’s been doing for his team. 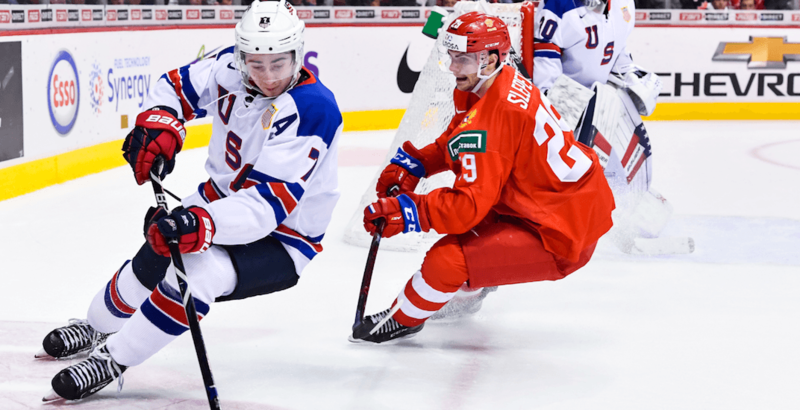 Hughes has no goals and two assists through six World Junior games, nowhere near the 20 points he put up in 17 NCAA games this season – but you can’t argue with Team USA’s results. Team USA Coach Mike Hastings agreed that Hughes has been doing the little things right during the tournament. “If you’ve ever sat across from Quinn you know he’s a competitor,” said Hastings. Meanwhile Tyler Madden, Vancouver’s third round pick in the same draft, has opened eyes about how good he is with his play at the tournament so far. After starting in a checking role for the Americans, Madden found himself starting the game for Friday’s semi-final. Midway through the game, he was playing on the team’s top line with Jack Hughes and Noah Cates. Coach Hastings was bursting with praise when asked about Madden’s evolution over the course of the World Juniors. “I trust Tyler a lot,” said Hastings. Madden spoke about the way he’s moved up the lineup as well. “At Northeastern I’m in a scoring role there so obviously that’s a role I like to play,” said Madden, who has 15 points in 14 NCAA games this season. He has three goals and one assist for the Americans in this tournament. Madden talked about the reception he’s received playing in Victoria and Vancouver. “It’s been pretty cool,” Madden said. “Not only the Vancouver fans but the support throughout the whole tournament in B.C. has been tremendous and it’s been really fun being here,” said Hughes. USA will play the winner of the second semi-final between Finland and Switzerland, in Saturday’s gold medal game.